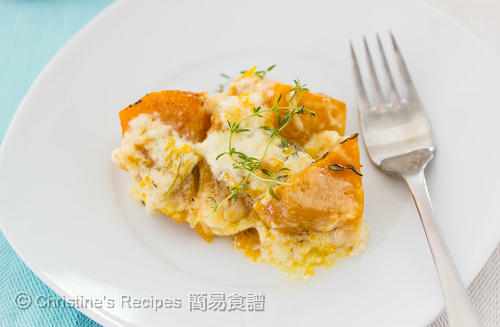 This creamy baked pumpkin recipe was adapted from "Cook with Jamie". Believe me, it's totally simple and delicious. 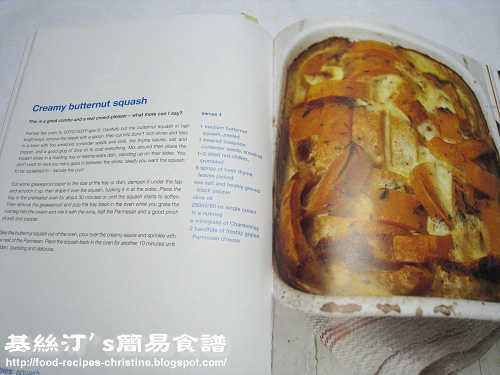 I chose and cooked this creamy baked pumpkin from the cookbook “Cook with Jamie” by Jamie Oliver, because of returning the favour for my daughter’s present to me. Pumpkin is one of my favourite vegetables. More importantly, this is a no-brainer recipe and a keeper for any days throughout the year whenever I crave for a pumpkin dish. I only used the ingredients that I’ve stocked in my kitchen. The original recipe yields white wine, Chardonnay and coriander seeds that I skipped in my cooking. Although I skipped these two ingredients, we’re very satisfied with the end results. This simplified version was delicious enough to make our taste buds dance. 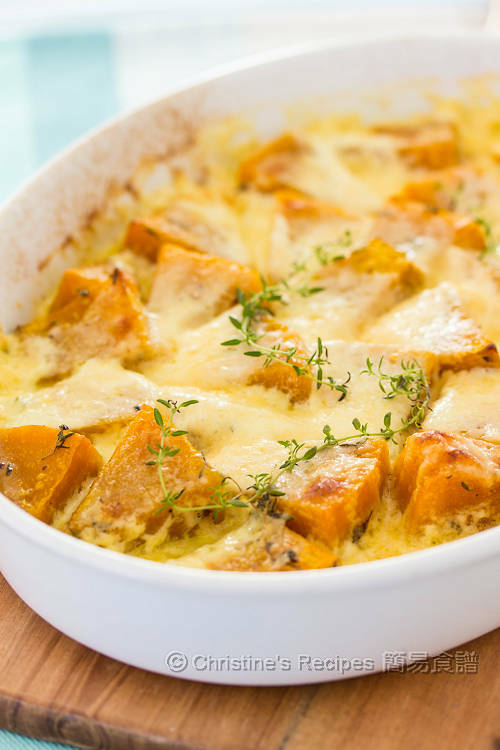 This baked pumpkin dish can be served as a side, perfectly pairing with beef steaks, lamb cutlets or baked chicken. 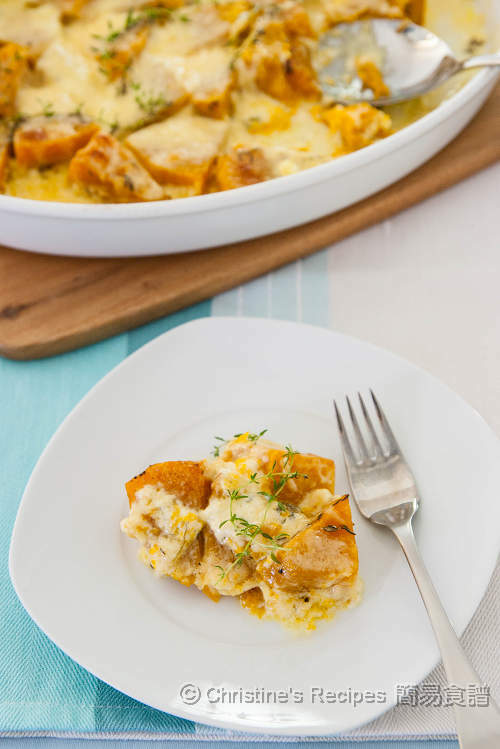 To myself, this pumpkin dish is the superstar of our meal. Its creamy texture and deliciousness was amazingly memorable. Preheat oven to 200C / 390F. Peel and deseed pumpkin. Cut into chunks. Put into a baking dish. Season with salt and pepper. Mix with thyme and olive oil. Bake in the preheated oven for 30 minutes. 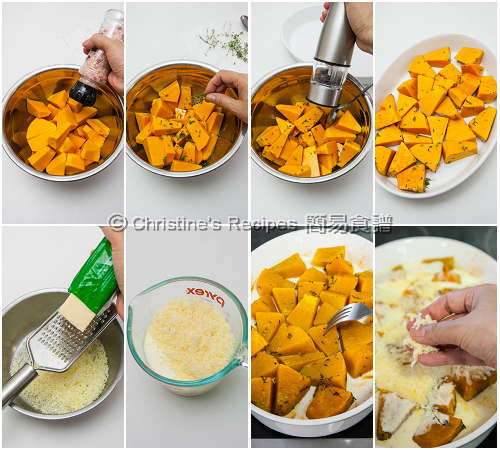 While baking the pumpkin, combine half of the parmesan cheese with light thickened cream. Mix in nutmeg. When the pumpkin turns soft after baking for 30 minutes, carefully remove the baking dish from oven. Pour in the cheese and cream mixture. Sprinkle the remaining cheese on top. Put into oven and continue baking for another 10 minutes, until the cheese melts and surface becomes lightly brown, bubbling arising. It’s done. Serve immediately. Fresh thyme is the best, but dried one can be used though. Nutmeg is a kind of spices, available at supermarkets. I also found nutmeg at Asian grocers with a better price. Must have tasted great with cream and cheese!